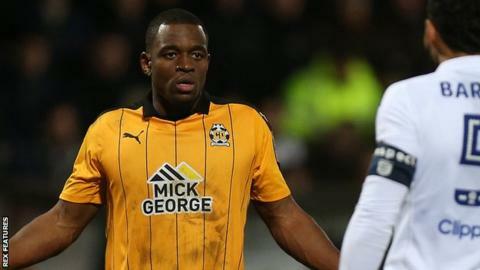 Cambridge United striker Uche Ikpeazu is set to be out for the next eight weeks with a hamstring injury. The 21-year-old has scored eight goals in 31 matches for the U's this season, but was injured in the closing stages of the League Two draw at Yeovil. He adds to a lengthy injury list, which includes Adam McGurk and Brad Halliday. "I think if you were to talk about our season and the impact certain players' injuries have made on our season it's staggering," said boss Shaun Derry. "I held a staff meeting on Thursday morning because it's concerning. This is something that we've got to look into. For me in particular, it's a big blow." Derry also confirmed that forward Barry Corr will be used from the bench as he continues his recovery from a 12-month injury absence, but Ben Williamson and Gerry McDonagh are both fit and available.